The United States were by no means fielding a vintage quartet but the reigning champions were still nonetheless tipped to close out the programme with their seventh successive title in this event. 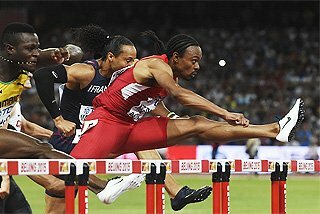 However, it became clear the favourites were missing the injured LaShawn Merritt – who anchored their quartet to a narrow win over Trinidad and Tobago at the last World Championships – and in a reversal of the outcome in Beijing, Lalonde Gordon overhauled world finalist Fred Kerley on the anchor for a famous win, 2:58.12 to 2:58.61. The women’s 4x400m final played out exactly as expected with Quanera Hayes handing on a big lead to Allyson Felix, who duly extended their margin with a second leg split timed unofficially at 48.7. 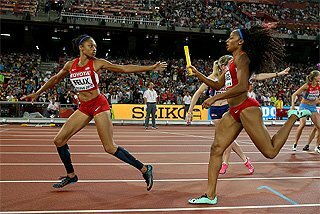 Shakima Wimbley and individual champion Phyllis Francis got the baton around without any skirmishes with the United States winning by the best part of half a length of the track in 3:19.02 ahead of Great Britain (3:25.00) and Poland (3:25.41). This was the United States’ 10th gold medal of the championships and the 11th of Felix’s unparalleled career. 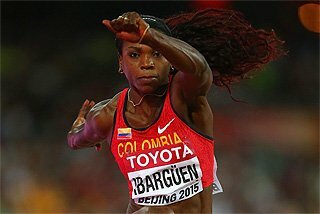 After running the second leg of their gold medal-winning 4x100m team yesterday evening, Felix became the most bemedalled athlete in World Championships history with 16 medals and after claiming her second title of the championships in the 4x400m, Felix matches Usain Bolt’s haul of 11 gold medals. Yohann Diniz has had more than his fair share of disaster and misfortune in major championships but everything came right for the charismatic Frenchman on a gloriously sunny morning on The Mall. The world record-holder required an unscheduled early race pit stop but he quickly slotted himself back into the leading pack, although not for too long. By the 10-kilometre checkpoint, Diniz was already 40 seconds clear of the pursuers and his lead had doubled over the course of the next 10-kilometre segment. Diniz has squandered seemingly insurmountable leads in the past but the three-time European champion has worked his way back into close to world record form after another tumultuous season, and never looked like faltering. 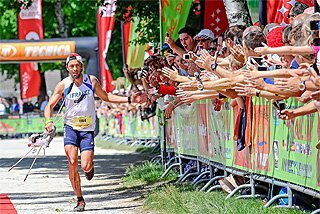 Diniz only resumed full training as recently as June after sustaining broken ribs in a car accident but he still crossed the finish line in a championship record of 3:33:12, a time second only to his world record of 3:32:33. The first edition of the women’s 50km race walk at the World Championships was fittingly capped with a world record from the event’s standard-bearer, Ines Henriques from Portugal. Henriques, who clocked 4:08:26 earlier this season, ended up finishing two minutes inside that time today, crossing the finish-line on The Mall in 4:05:56 ahead of China’s Yin Hang in an Asian record of 4:08:58. 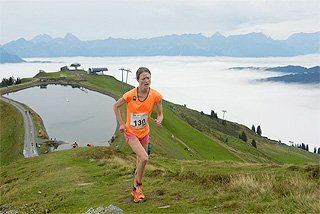 In contrast to the 50km, both 20km races went down to the wire. 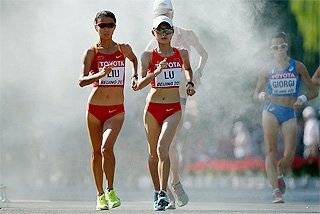 China looked on course for another brace of medals in the women’s race with Yang Jiayu winning in 1:26:18 by one second ahead of Mexico’s Maria Guadalupe Gonzalez but disaster struck for Liu Xiuzhi, disqualified on the purple carpet leading into the finish. Italy’s Antonella Palmisano was the beneficiary, taking bronze in 1:26:36. 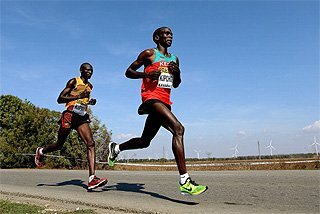 The men’s 20km race walk was another see-sawing affair which saw the medal positions change constantly in the last five kilometres. Six years after Colombia won this title courtesy of Luis Fernando Lopez, Eider Arevalo followed suit in a national record of 1:18:53 ahead of teenager Sergei Shirobokov (1:18:55) and Brazil’s Caio Bonfim (1:19:04). 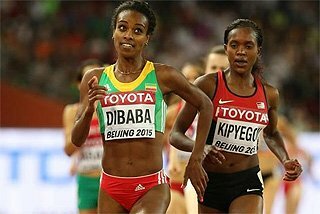 Kenya topped the medal table at the last World Championships in Beijing with seven gold medals and on the last night of competition, Hellen Obiri and Elijah Manangoi brought their tally up to five across the championships, putting them second on the medal table behind the United States. A silver medallist behind Vivian Cheruiyot at the Olympics last summer, Obiri followed – and weathered – Almaz Ayana’s trademark mid-race break before producing a blitzing final circuit of 60.11 to scupper the Ethiopian’s chances of achieving a long distance double. Obiri stopped the clock at 14:34.86 with Ayana fading to second in 14:40.35 – some 16 seconds slower than the second half of her momentous run in the 10,000m last Saturday. Manangoi banished the memories of an injury-ridden Olympic campaign last summer by claiming the 1500m title, and dethroning the three-time reigning champion Asbel Kiprop in the process. 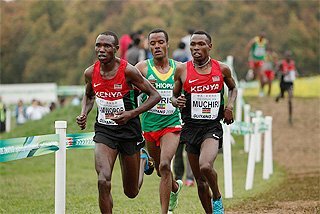 A medal sweep looked possible at the 800m checkpoint in 1:57.55 with the Kenyan triumvirate eight metres clear but while Manangoi and Timothy Cheruiyot filled the top two spots on the podium in 3:33.61 and 3:33.99, Kiprop – who seemed to be returning to form during the rounds – faded back to ninth in 3:37.24. While this has been a championships of shocks, not even six races in 10 days was going to stop Caster Semenya from regaining her world title in the 800m. 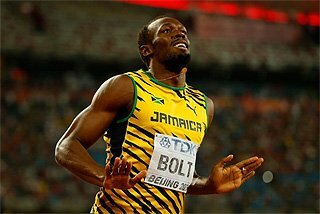 Semenya was sixth at the bell but the South African pulled out a sizeable negative split of 56.63, crossing the finish line in a world-leading 1:55.16 – the second-fastest winning time in championship history after Jarmila Kratochvilova’s 1:54.68 from 1983. Croatia’s Sandra Perkovic now has two world discus titles to go alongside her pair of Olympic titles, as well as her four European crowns. 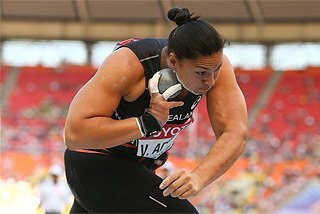 Perkovic’s second-round throw of 70.31m – the first 70-metre-plus throw in a World Championships since 1991 – placed her in an unassailable position, although her winning margin was cut back drastically in the sixth round when 2009 world champion Dani Stevens from Australia added nearly two metres to her lifetime best and Oceanian record with 69.64m. Mutaz Essa Barshim had never claimed a global outdoor title before tonight but the Qatari – who eschewed the indoor season and competed sparingly over the course of the summer – arrived in the British capital with his legs full of jumping. Unbeaten this season, Barshim cleared 2.35m on his first attempt before three close attempts at 2.40m to secure the title from Danil Lysenko at 2.32m. 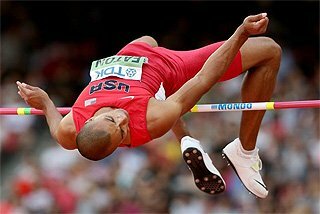 Syria’s Majd Eddin Ghazal won a bronze medal on countback by virtue of a second-time clearance at 2.29m to become just his country’s second medallist in World Championships history after Ghada Shouaa, who won a gold medal in the heptathlon in 1995 and bronze in 1999.